It’s funny how me eat heavy/rich food all December, and then once Christmas is gone, we immediately reach for our fruit bowls or salad bowls. However, being a greedy person like I am, my guilty highlight is to go to supermarkets after Christmas and scoop up some unwanted luxuries. What could be more decadent than lobsters? I spotted these in Aldi, two lobster tails for £7.99. It’s still expensive but they are normally at least £10. Plus they are raw. I’m not keen on buying cooked seafood, I have no idea why people would buy cooked tiger prawns or cooked mussels. With raw seafood you get their sweet liquid seeping out when you cook them. Not with cooked ones! There are so many ways to cook lobsters and even you just bake them with a bit of garlic butter it’d be heaven. But I want to make it super special. This dish will not be a stranger to my fellow Hong Kong folks. It is such an 80s dish and it is just pure self-indulgence. Enjoy! A decadent rich lobster dish with cheese sauce and ginger noodles. Heat the butter in a pan and fry the bacon until crisp. Add garlic. Put in a splash of white wine, cook until it reduces by half. Add in double cream, cook until it's a thick cream consistency so you can spread the sauce on the lobster tails. Put the lobsters in a roasting tin and spread with sauce, put grated cheese on top and bake for about 20 minutes, until it's golden. Meanwhile cook the noodles in a wok with sliced ginger and spring onion with soy sauce. 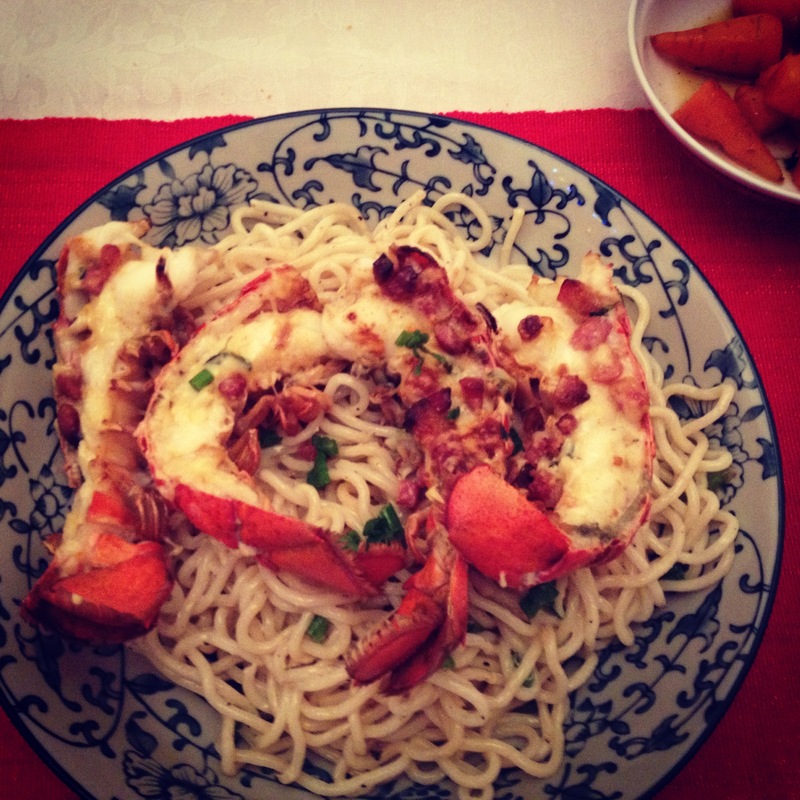 When lobsters are ready, toss the noodles with the lobster and juices in the tin. Serve hot.